A new short range /long range transport airliner is under way at the MoTIS design factory and she is a very nice aircraft! 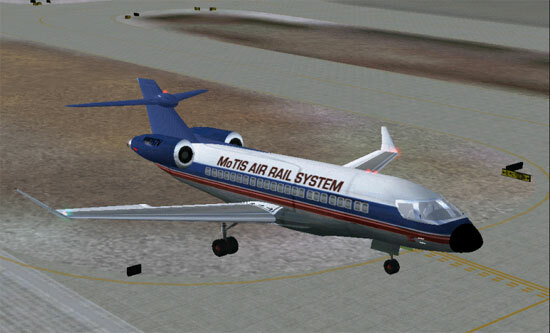 This aircraft is designed to be the medium range aircraft of the MoTIS commercial airliner fleet. We at team MoTIS are building a total airliner fleet for the future! Now when we say future we don't just mean futuristic looking necessarily as the next generation of the MoTIS airliner fleet mission is to meet the next transition of a 30 year period only. As now real world American aircraft companies makes don't tend to make huge futuristic leaps in aesthetic technologies unless it is beneficial from energy, ergonomics, or cost reduction reasons, team MoTIS is following that same realistic standard. As aviation shows more of its futuristic mecha according to real world chronological time lines. Then and only then we revel some truly out of this world designs! The REGALA is going to make up what we are calling the Aero Triad. This so called Triad is the link between a three aircraft building program that will provide the pilot and the airliner operation with a premium of choice for the middle range air carrier market. 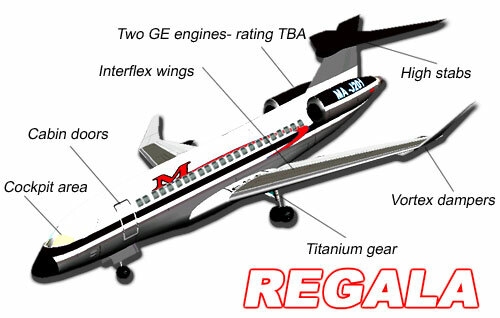 As regional aviation has really come of age since deregulations, the REGALA could have a real world place (Virtual for now) in these expanding markets as she is designed as a true STOL low wing airliner with god forward speeds and passenger hauling capacity. A ton of work goes into the MoTIS development mission for each or our numerous designs and the number one thing that we strive to achieve is the total reality comparison and capability of all of our neo concept designs. It is always challenging to design an aircraft and defiantly a challenge to make sure that these designs fly as we actually design them so we thank you for your continued interest in our testing, and real time mission as we are busy trying to get it just right! The wings on the REGALA have been updated and we will be getting to the Horizontal stab and elevator painting soon! The Stab/Elevator have been down sizes and nights lights have been added. 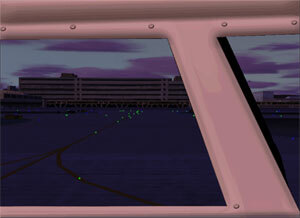 We are also working on night textures and the final 360 2D cockpits views now-To preview soon! We have flown her up from the MoTIS testing labs today (Real Time) all the way to KYIP- Willow Run airport to get the lead out and are headed back to X ROX testing facilities... Its been a busy day.. This shot gives you a good idea of the room and dimensions of this aircraft- also full specs to be posted soon... Also remember that she is a true mid size regional air carrier! The MA-J201 SPECTON REGALA, or just REGALA for short we have designed a shorter (and we don't mean STOL/VTOL) take off and landing airliner with a reduced stall speed and increased surface area wing. While this is great for take off and landings the increased induced drag will add to the diminishment of the speed and range characteristics. Aircraft design and development is truly about compromise and change as it is just as much and art as it is a science. As usual we always give credit to all aircraft contributors and CAD designers. This aircraft is the sole design work of O Watson and J Guess. Three different panels exist for this aircraft with full 360 custom panel views! Copyright (C) 2002, 2003, 2004 , 2005, 2006, 2007 by MoTIS INDUSTRIES All rights reserved.